Hello and welcome to the third episode for beginners – the long summer break is finally over and I hope I can produce more shows for you these coming weeks. Not only episodes for beginners, but also for advances learners. Today, I want to pick up a topic that listener Burt asked me to cover: The German alphabet. I will go through the 26 letters now slowly so that you can hear how they are pronounced. Then there are the „Umlaute“: Ä Ö Ü and we have a special „s“-sound, the ß. You don’t hear a big difference, I know. Don’t worry about that now. While we are at the topic of pronounciation: JJ from New Zealand asked me to tell him the difference between Z and S. There’s a big difference there! For example: We say Sahne, meaning cream, but Zucker, meaning sugar. The Z is pronounced like a t and a s. TS. More word with Z? Let me think. How about Zahn for tooth, Zeppelin, Zimt for cinnamon or also words with the Z in the middle like Beziehung for relationship or Katze for cat. And one last thing: We have another sound in the German language, that is quite hard for beginners to pronounce. The CH-sound. It is either ch or ch. I’ll give you some examples: Koch for cook, Buch for book, wach for awake. Or kichern for to giggle, Becher for cup and seicht for shallow. So much for this quick lesson in German pronounciation – we’ll end with a repetition of the alphabet. Hope you tune in next time and tell your friends about this podcast! Bis bald, Eure Annik. Hello and welcome to the series „Absolute Beginners“ here at Slow German. There will be new episodes as before, but I will include a few episodes for absolute beginners. They are meant for people who for example are travelling to Germany and who want to speak a few words in the native language… The first one of these was published some time ago, and today I want to give you all the vocabulary you need to go to a restaurant and eat something. After all, I don‘t want you to starve here in Germany! At first if you enter the restaurant, you might be greeted by a waiter. This is not at all common in Germany – most people just seat themselves. So if you don’t see somebody steering towards you, feel free to choose yourself where you want to sit. In case a waiter welcomes you, he might ask „Haben Sie reserviert?“ or „Haben Sie eine Reservierung?“. He wants to know if you have made a reservation in advance. You can say, „Nein, tut mir leid“, meaning „No, I’m sorry“, or „Ja, auf den Namen Schmidt“. Of course you have to replace the name Schmidt with your own name. The waiter might also ask you: „Für zwei?“, meaning „For two?“, if he sees that there are two people in your party. Or „Für vier?“ if there are four. He will then show you to a table that’s big enough for all of you. „Einen Orangensaft, bitte.“. An orange-juice, please. „Eine Cola, bitte.“ A coca-cola, please. „Ein Mineralwasser, bitte.“ Sparkling mineral water, please. Or, of course, „Ein Bier bitte.“. I guess I don’t have to translate that. Now let’s think about food. You pick something from the menu and say „Ich hätte gerne…“, and then you say what you would like to eat. If you can pronounce it, I am very proud of you. For example you can order a Schnitzel and say „Ich hätte gerne das Wiener Schnitzel“. If you are a little shy, just say „Ich hätte gerne das hier“, and point to what you would like to have on the menu. If you want something special that you can’t find on the menu, just ask: „Haben Sie …?“. For example: „Haben Sie ein Wiener Schnitzel?“. It simply means: Do you have a Wiener Schnitzel? Let’s hope everything worked out fine and you’re sitting there with your drink and your food. The waiter will wish you „Guten Appetit“, literally meaning he wishes you a healthy appetite. But something is missing. Just call the waiter by establishing eye-contact, maybe raising your hand and saying „Entschuldigung“, meaning simply „Excuse me“. Then wait until he or she comes to your table. In former times people said „Herr Ober“ or „Fräulein“, but that is thought to be old-fashioned today and some waiters and waitresses even consider it to be rude. „Könnte ich bitte einen Aschenbecher haben?“ means „Could I have an ashtray, please?“ But be careful: Most restaurants nowadays are smoke-free. If you have to use the bathroom, you can ask: „Entschuldigung, wo ist die Toilette?“. At the end of your meal, the waiter will clear the table and say something like „Hat’s geschmeckt?“, he wants to know if you enjoyed your meal. You can simply answer by saying „Ja, danke.“, or if you really liked it, say „Sehr gut, danke.“. You can then order some coffee or dessert, and if you’re done, ask for the cheque by saying „Die Rechnung, bitte.“ or „Ich möchte zahlen, bitte!“. Remember, there’s one big difference between dining in Germany and dining in the US. In Germany, you can usually sit at a table as long as you want. 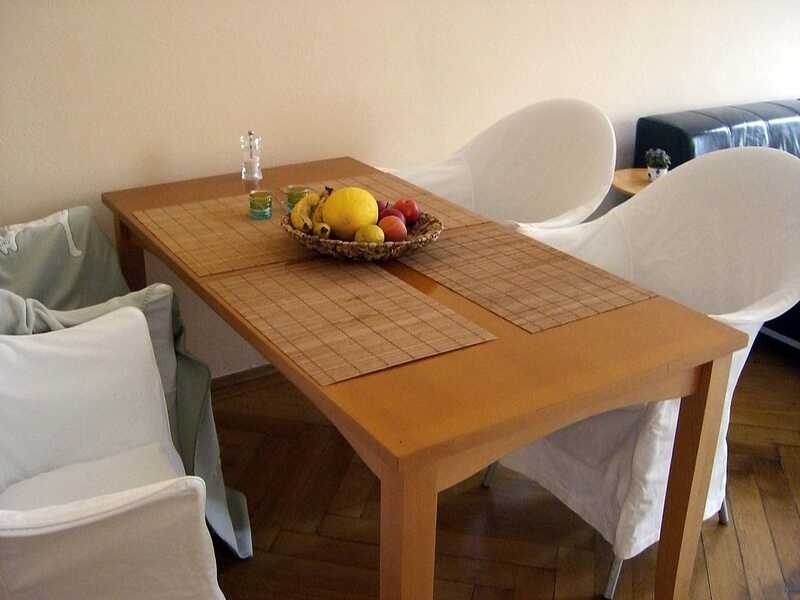 After your meal, you can just sit there and enjoy your coffee or drink some more wine or beer and just talk for hours. You don’t have to rush out of the restaurant as soon as you’re done eating. But it is polite to not sit at an empty table, but order some drinks. That’s it for now – for more information on this podcast visit slowgerman.com or check out the new iPhone app. 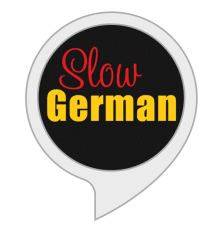 You can also follow Slow German on Twitter and Facebook. Have fun learning German and Auf Wiederhören!